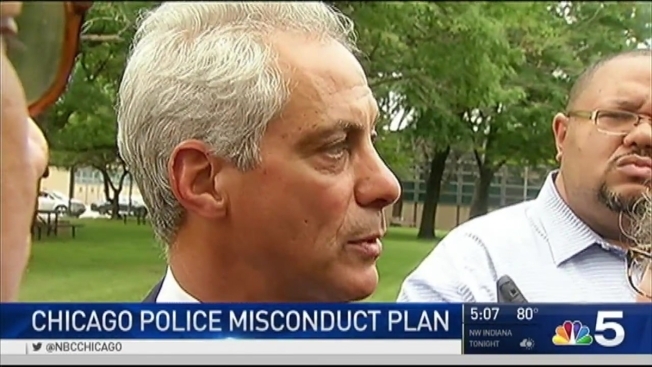 After months of promising to revamp the Chicago agency that investigates police misconduct, Mayor Rahm Emanuel made a brief and reportedly contentious appearance in front of Chicago aldermen Thursday to detail the coming changes. But lawmakers said even after the briefing, there are still no definitive answers on what's to come for the Independent Police Review Authority. "There's going to be an independent group, a citizen's group, that will oversee the situations and events that happen as it relates to the police use of force," Emanuel said at a separate event Thursday. Following the release of the video showing a Chicago police officer shooting 17-year-old Laquan McDonald 16 times, the fallout at the Chicago Police Department has been stunning. Multiple hearings have documented problems - the IPRA had too few investigators, and rarely punished police misconduct. But while Thursday's three hour, closed-door meeting gave aldermen an outline of what Emanuel envisions for a new police investigative agency, they said afterwards that they were still looking for details. "There are changes to what IPRA's authority is, there's changes to a whole host of things - the problem is, we don’t know all of the specifics," 45th Ward Alderman John Arena added. "I think when we see the draft ordinance, we’ll know more," 32nd Ward Alderman Scott Waguespack said. Emanuel announced a plan to dismantle the IPRA in May, promising to make changes including the addition of more civilians and a bigger budget, all in an effort to rebuild trust with the community. "They’re giving us bullet points but we haven’t seen the language," said 22nd Ward Alderman Ricardo Munoz. "They’re promising the language by Monday, we’re hoping to see it then." City attorney Steve Patton handled most of the briefing Thursday, which was described as contentious, and Emanuel reportedly attended the meeting for less than five minutes.